2017 Grant Application Now Available! 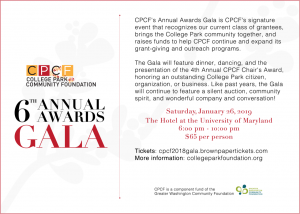 The College Park Community Foundation is currently accepting applications for fifth annual grants cycle! Our grants (ranging from $250-$1,500) support nonprofit organizations that positively impact the College Park community. Applications are due by 11:59pm on July 31, 2017 and organizations will be notified by September 1 if their application will be funded. Request a copy of the application form by filling out this short questionnaire. As a part of our commitment to fiscal responsibility, we are asking each applicant to meet individually with a board member prior to submitting an application. We will also be holding “Office Hours” for drop-in meetings with board members in late June and early July. Those dates will be announced shortly.